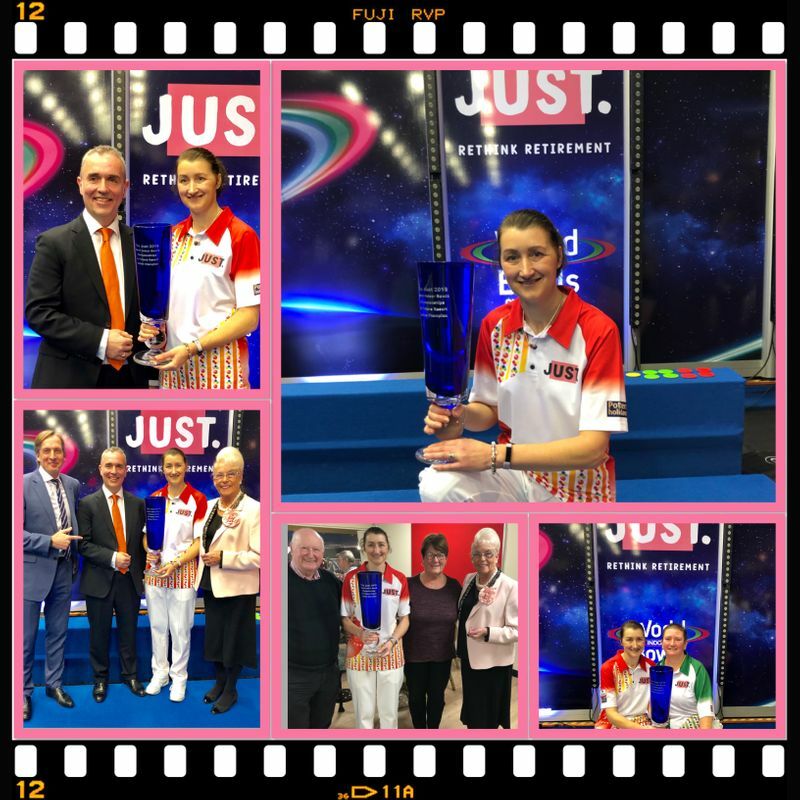 Scotland’s Julie Forrest achieved a lifelong dream today when she was crowned the Just Women’s World Matchplay Singles Champion for the very first time, winning in front of an appreciative capacity crowd in the International Arena at Potters Restort. In an enthralling match that had everyone on the edge of their seats against 2011 winner Alison Merrien MBE, Julie shot out of the traps in the first set and led 5-0 after just five ends then 7-3 with two ends to play. However on the penultimate end she found herself trying to avert the loss of a full house of four, but a crowd interruption meant she had to delay that crucial last delivery for several minutes and on the resumption of play she failed to alter that count taking the scoreline to 7-7 playing the last – where she was happy to count the required single. In the second she once again got off to a flier, scoring singles on each of the opening four ends but Alison came charging back with a single and a four to take the lead for the first time in the match at 5-4. Four ends later they once again stood all square on the penultimate end at 8-8. Alison then held a set lie but with her last bowl Julie played a perfect timing shot into the head and took the place of the holding shot to take the title. Jumping with excitement down the rink, Julie reminisced “I could hardly feel my legs when I was running down the rink. I thought I was going to collapse after that last bowl. I’m still shaking. This title really means so very much to me. “This is the icing on the cake. It’s a title that’s eluded me for a very long time so I am just ecstatic to win it”. A disappointed Alison said “I was fairly pleased with my game and the way I played, but every time I managed to do something Julie virtually bettered it. It was a terrific game though”.